Hillary was confused last Sunday when she told NBC's "Meet The Press," "The unborn person doesn't have rights." The New York Times reported because of her remarks, she "faced criticism from both sides of the abortion debate." That's putting it mildly---some Planned Parenthood leaders were livid, while pro-life leaders said, "I told you so. She knows the unborn is a 'person'---and yes they do have rights---they have the right to life." Actually, America was founded on the fact that all persons have the God-given right to "Life, liberty and the pursuit of happiness." Is the secular progressive Left that callous, or simply that confused? The New York Times reported, "Hillary Clinton faced criticism from both sides of the abortion debate...after she waded into the fraught argument about when life begins by describing the unborn as a 'person'." The NYT quotes a Planned Parenthood leader: "Hillary Clinton further stigmatizes abortion---She calls the fetus an 'unborn child' and calls for later term restrictions." 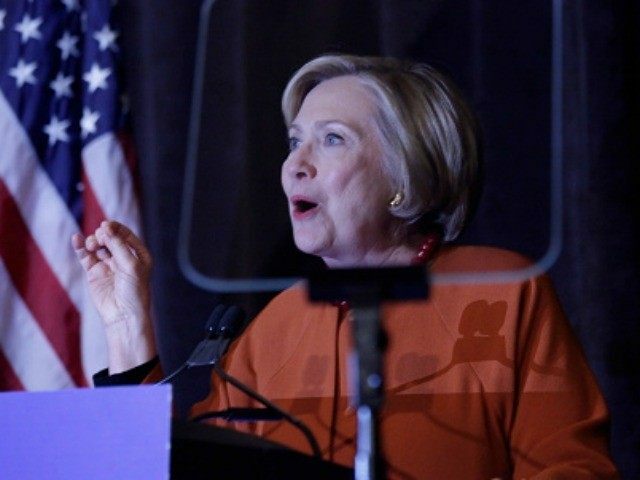 Apparently trying to recover, Hillary stumbled on saying, "That doesn't mean we don't do everything we possibly can, in the vast majority of instances, you know, help a mother who is carrying a child and wants to make sure that child will be healthy, to have medical support." These are not the words or the "values" upon which Planned Parenthood has risen in the American culture. "Person" is a legal concept that includes rights and statuses that the law protects, including protection of a person's life under the laws against homicide. Pro-choice abortion advocates labor to convince America, and the world, that their pro-abortion brothers and sisters should not use the term "abort a child," rather they should use alternatives such as "end a pregnancy" or "have an abortion." Planned Parenthood guidelines point out, "the term 'abort a child' is medically inaccurate, as a fetus is not yet a child." However, sometimes the mask slips and common sense and truth escape the prison cell in the back of the secular progressive Left's mind and their mouth says what their mind knows to be true---and science affirms--the bump in the belly of the mom is, in fact, a baby---a person---a young, unborn human being. Ironically, Hillary's confession came at the same time Cecile Richards, CEO of Planned Parenthood, was campaigning for Hillary in Wisconsin. In each of her speeches she was telling people regarding electing Hillary, "This is sort of the pinnacle of everything we've fought for all our lives..."
It is. And it's sad. They won't hold Hillary's confession against her, because Hillary and her sisters have fought for this all their life. She has stood for abortion on demand since she forsook her parent's conservative beliefs. She has become the embodiment of the abortion culture and the driver of the lucrative abortion industry, led by Planned Parenthood. She is the pride of Planned Parenthood and its founder, eugenics advocate Margaret Sanger. Rep. Marsha Blackburn (R-TN) said of her "no rights" comment, "The analytical coldness with which she dismissed rights of unborn children reveals a type of hardened core that shocks the conscience." She said, "Her comments reveals a mind set that lacks any compassion for the unborn children and may signal an intention to use executive action to block even minimal protections of life at its most vulnerable stage." There is, for sure, a coldness about the abortion business that shocks the conscience. There is also a sad deception about it all. While researching this episode in the life Hillary and her abortion comrades, I noticed an interview that was not about Hillary, but about the "coldness" and "deception" of it all. And because I knew the interviewer and the person being interviewed, I looked at it. Perry Atkinson on his Dove TV's "Focus Today" was interviewing the late Madalyn Murray O'Hair's son, William J. Murray III. Many of us remember that Ms. Murray O'Hair used her then 6 year old son to sue and ultimately get prayer removed from the public school classroom. In 1980, son Bill left his mother's atheistic beliefs and accepted Jesus Christ as his personal Savior. I interviewed him many times on our own nationally broadcast television program. The point I most remember is that Bill said he came to realize that his mother didn't really believe in the atheism she professed. Through it, she found fame and fortune---but it wasn't real---she really didn't believe it. Bill told me while his mother professed atheism, they celebrated Christmas, Thanksgiving and Easter in their home, with Christmas trees adorned with angels, shepherds, stars, etc.---they even told the Christmas story and the Easter story. And were told not to tell anyone. Atheism, he told me, was her business. His interview with Perry was about how religious freedom is being attacked in the United States; then it turned to the subject of abortion. Bill noted that there was a period in Israel after King David, where making sacrifices of infants and burying them at your doorstep in order to bring good financial luck was an acceptable thing to do. This was a form of worship to the god Moloch. He said, "I mean, there were actually some people worshipping Moloch, just because society is doing it or society is approving it doesn't make it right." He added, "We still sacrifice babies to Moloch today for the financial good of the family. We call it family planning, and say, if we abort this baby, the family will be better financially, so it's okay." Moloch became a serious issue among the people of God. And God addressed it. Moloch is mentioned several times in the Old Testament. For example, in Leviticus 18, the issue is addressed. In verse 21 God says, "You shall not give any of your offspring to offer them to Moloch..." and in Leviticus 20 the Lord directs Moses to tell His people, "Any man from the sons of Israel or from the aliens sojourning in Israel who gives any of his offspring to Moloch will be put to death..."
The message from God through Moses continues and warns His people even if they "disregard" the practice---fail to take a stand against it---He will set His face against that man and his family. Whether we have become so calloused that we have become cold and indifferent to life itself, or we are merely trying to go along with so-called "evolved beliefs," when we allow, much less support abortion as a right, we are miserably failing God. Yes, he said, "Give me liberty or give me death." But he also said, "When people forget God, tyrants forge their chains." It's time to wake-up, clear our minds, embrace common sense and recommit our hearts to the God who gave us life, liberty and the pursuit of happiness. Bill Gothard in his seminars stated that "a man's morality will tend to dictate his/her philosophy". I am reminded of that every time I hear arguments or discussions regarding abortion. And now I hear something about a temple for Baal being put up....where? New York City! The capital of abortions, apparently. The person in the womb pays the ultimate price, and the mother gets nothing. I'm not saying the mother should get the SAME as the person aborted...I'm just saying, you know....not so equal, for "equal rights". Sounds about like the most unequal equal rights movement ever. Things were a whole lot more equal in the days of MLK Jr.